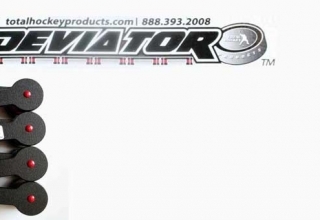 Purpose – The purpose of the X-passer is simple, to return the puck to you. Having a device like this in your training regimen will help you improve your passing and help you develop quick hands. I tested the X-Passer out at home and tested it against a number of other pass rebounders. Passing – It was very easy to pass into the X-Passer, it is built with a nice wide mouth so you can easily pass a puck into it. The only downfall I could think of with the X-Passer is the price, I find $169.95 a little bit steep for some plastic and a bungee cord, but it does work great so if you are going to use it a lot then I guess you will get your money’s worth. 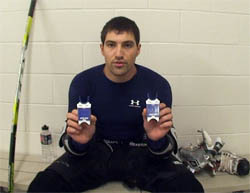 Jeremy, you speak highly of the X-Passer but I can’t find it on either HockeyShot.com or HockeyShot.ca (I’m in Canada). Did they stop selling it? Yeah I think it is the best out of the pass rebounders but they just signed an exclusive deal so you can only buy it from a certain store or something like that. Hockey Shot had to stop carrying it, kind of a bummer.